NEW ORLEANS — Not much changed from Week 6 to Week 7 in the NCAA Division III Women’s Cross Country National Coaches’ Poll — at least when it came to the top-7 teams. 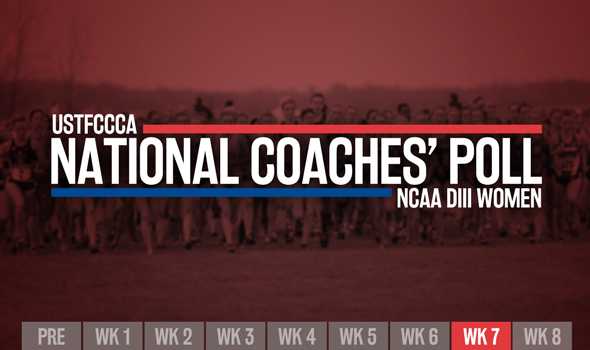 All of the teams that were ranked in the top-7 in Week 6 remained in place when the most recent poll was released Wednesday by the U.S. Track & Field and Cross Country Coaches Association (USTFCCCA). If you need a refresher, here are the top-7 teams in order: Johns Hopkins, MIT, SUNY Geneseo, Washington (Mo. ), Williams, Tufts and UW-La Crosse. Some of the biggest change in the poll came at No. 8, where Bates jumped 12 spots from No. 20. That marks the best ranking in program history for the Bobcats. What led to that improvement? Well, Bates upset previous-No. 8 Middlebury at the NESCAC Championships this past weekend. The Bobcats finished a distant third behind Williams and Tufts, but used a strong top-3 (9-14-16) to knock off the Panthers. Dickinson comes in at No. 9, tying its best rank in program history (Week 2 and 3 in 2014). The Red Devils took second in the team standings behind the top-ranked Blue Jays (21-75) and saw Sofia Canning lead the way with a 7th-place individual finish. Working our way further down the poll, Colorado College and Nebraska Wesleyan both moved into a tie for 23rd. We neglected to mention this last week, but when the Prairie Wolves joined the poll in Week 6, it was the first time they were ranked since 2012 when they were 33rd. One spot behind that duo sits DeSales, the Middle Atlantic Conference champions. The Bulldogs returned to the poll for the first time since Week 3 thanks to a dominant effort in Grantham, Pennsylvania where they put four runners in the top-7. DeSales’ ranking (25th) is its best in program history. The Bulldogs were one of four teams that either returned to the rankings or were new to the poll in Week 7. The others were Brandeis (returning), John Carroll (new) and Haverford (returning). This is the penultimate poll of the regular season. The final poll will come out November 14 and will coincide with the results from the Regional Championships that would have concluded three days earlier and serve as a preview for the 2016 NCAA Division III Cross Country Championships on November 19 in Louisville, Kentucky.